Hofstra Pride Guides: Soccer as the Beautiful Game! Soccer as the Beautiful Game! Over 300 journalists, scholars, and fans from over 25 countries were on campus this weekend to attend the international conference, “Soccer as the Beautiful Game: Football’s Artistry, Identity & Politics.” This conference looked at the economic, political, and the social impact that soccer has. An immense highlight of this conference was the appearance of international soccer legend, Pele! Over one thousand people attended the John Cranford Adams Playhouse during this conference to be there as Pele was awarded an honorary degree from Hofstra University! There is also a plaque in the James Shuart Stadium now commemorating Pele's visit to our University! Truly an amazing event full of appreciation, inspiration, and of course, soccer! 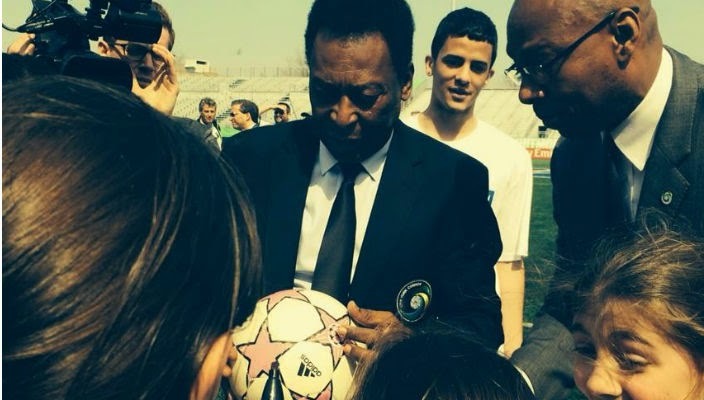 Pele signing autographs at the youth soccer clinic held at Hofstra!